Our bodies are vitally important to our Well-Being. They talk to us endlessly, sometimes flowing easily and effortlessly and other times being cranky and uncooperative. Everything from aches and pains, sore backs or stiff necks, or the sweet feeling of moving as if the wind was holding us up, all of these are ways our bodies try to get us to pay attention. They are indications of what's happening within us and they want to be noticed! Life goes by quickly and so often we don't slow down long enough to acknowledge our bodies, let alone to understand what's going on inside. And because we don't do that, we have no idea what's going on, and therefore, no idea what we can do to help. Here's a novel concept, how about stopping and really listening to what our bodies are trying to say. I'm an expert in the field of stopping and listening to bodies, and finding a way to relieve them of whatever they are holding. That's one of the reasons people come to me. When clients enter my office for bodywork or a massage, they immediately feel a difference in the energy. My office is peaceful, imbued with intention and helps folks relax, let go and deepen into themselves. Whether they know it or not, just arriving in my office means that they are intentionally doing something to make their bodies, minds and spirits feel better. I guide clients to slow down, to pay attention to their body and take an inventory of how they are feeling. Then I have them begin to breathe, deliberately and slowly. Breath brings you right back into yourself. It's one of the best tools you have at your disposal, you don't need me to access it. You can even relax yourself with guided, meditative breathing. Bodies melt under my touch. 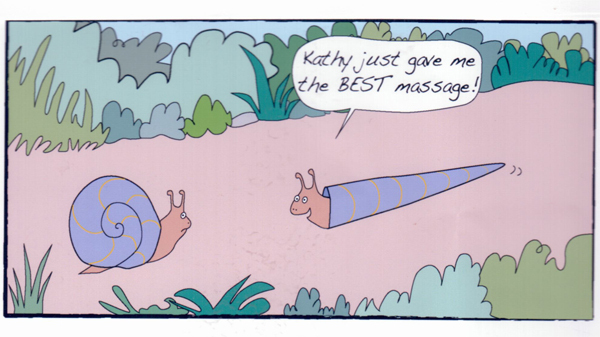 Places that have been holding emotions or tension finally feel safe enough to unravel (like the snail in the cartoon!). People feel more connected with themselves and happier. There is less pain, more flexibility and hopefulness when clients leave my office. So if you're feeling any pain or discomfort in your body, take a moment to see if some bodywork would be helpful, or if it would simply feel good to be nurtured and cared for my another human being. The exploration of your Self and your body can be easy and fun. And you deserve to feel great in your body!